We’re gathering as many stories as possible about the Ven. Khenpo Rinpoches for an upcoming book, and we’d love to include yours! Please email it to: memories@padmasambhava.org. One of my many memories of Khenchen was in 2004 during the White Tara retreat in Asheville, NC. A fire puja was set up in a little park area by a pond where the Khenpos were seated with all the ritual items. The gentleman who was getting the fire started was having a little trouble. There was a lot of fussing and relighting and adding more material to the fire bowl. This went on for a while with only a little puff of smoke going up. Finally Khenchen Rinpoche became frustrated and got up out of his chair and walked toward the bowl. With a determined look on his face, he gave the bowl a look—and what a look! At that moment the bowl burst into flame! I first met the Khenpos just after the New Year in January 2000. I found myself making frequent trips across the state of Florida between where I was living on Pine Island on the West Coast and the Dharma Center in West Palm Beach. During this time, I would leave after work and make the 3-hour drive in time for Heart Sutra practice with the Khenpos and the sangha. On one occasion I prepared Tibetan food, including momos, and packed it in a cooler to deliver to the Khenpos after practice. As the Khenpos were preparing to leave that evening I brought the cooler of food from my car intending to give it to Joe Scarpa who was driving Rinpoches. However, Joe insisted that I deliver the food to them myself. As I was very shy and reticent to put myself forward at that time, Joe literally had to push me toward the open car door where Khenpo Tsewang was sitting. Khenpo Tsewang swung his feet out of the car door and sat facing me on the edge of the seat. He took both of my hands in his, and held me there in front of him. Joe told him that I had brought a cooler of food for them, and Khenpo asked me what I had brought. He held me there in front of him, calming me as we spoke. 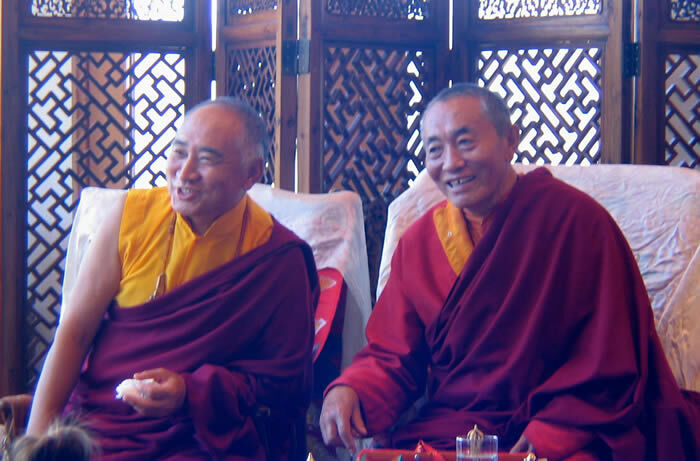 Khenpo Tsewang did not release me until I was completely relaxed and filled with joy and appreciation for having had this wonderful moment of connection with my teacher, a moment in which time seemed to stop and I was bathed in his compassionate presence. My favorite story of Khenchen Rinpoche was when I was in the garden near the Rinpoches’ house at PSL tending to their blueberry bushes. 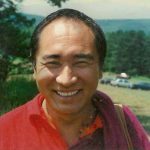 I didn’t realize it, but Khenchen Rinpoche was in the retreat cabin, and at some point he came out when I was struggling with Japanese beetles on the blueberries. We worked together for some time. He held a bag, and I would pull a beetle off the bushes and put it in the bag and he would quickly close it. Then I would pick up another one and he’d open the bag, and I’d put that beetle in while the first one flew out. We did this for a while; Khenchen was laughing like a little child as we played this game…until one point when he looked at me with this profound wisdom and penetrating look and walked away. At the time I understood it to be a teaching by example of the faults of samsara. Around the time I first met the Khenpo Rinpoches some 20 years ago, I had a very vivid, detailed vision of something bad I had done in a past life. I was quite distraught and it continued to haunt me for years. I finally had the courage to talk with our Khenpos, who suggested I do Vajrasattva practice. I did that for over a year, but the flashbacks continued. So I went back to them. At that point Khenchen looked at me and said, “This is how you do it” (radiating out). Within a month it all dissolved. My gratitude is endless. Just after I completed a 3-month retreat at PSL, for my first venture off the land I joined someone on their shopping rounds to Kmart. It was a surreal experience. Everything and everyone manifested as samsara. 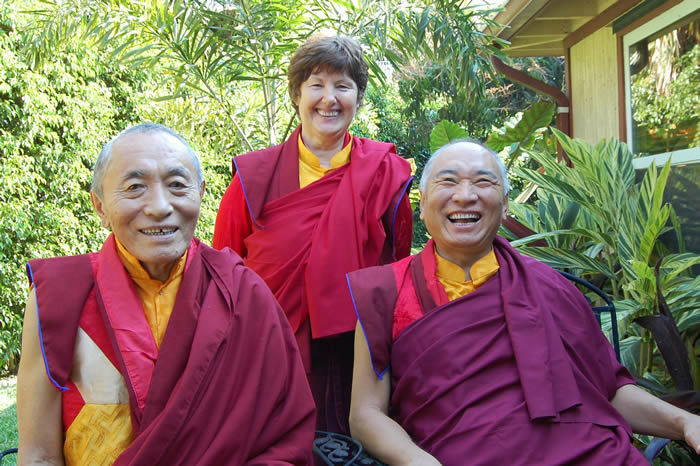 I came back totally devastated, and immediately sought out Khenpo Tsewang. I sat across the table from him and with the full weight of my shock, said “Rinpoche, I just came back from Kmart,” expecting him to instantly understand the significance of this. Instead, Rinpoche’s eyes lit up, and with great delight he said, “Oh, which one?” It turns out that Rinpoche really enjoyed Kmart, and began picking things up from the table to show what all had been bought there. That very moment I saw that the suffering was arising from my own mind and really had nothing to do with Kmart. 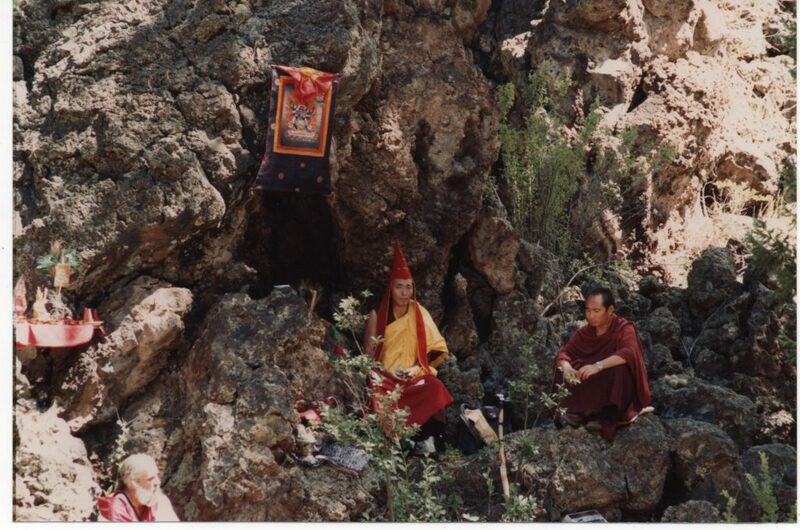 In July 1991, the Khenpo Rinpoches led a Vajrakilaya and Chod retreat out in the desert in the Zuni River Valley of New Mexico. About 20 of us were camped out there. It was a magical time. The most memorable part of the Chod teachings was when Khenchen used chalk to draw a baseball-diamond-like arena in the dust near some mesquite trees, and then he danced on it. He danced in each of the four directions, calling the demons by singing the Chod melodies and playing his big hand drum and thigh-bone trumpet. As part of the Vajrakilaya teachings, Khenchen gave the empowerment while sitting in a hollow of a big lava rock. A small shrine was arranged in another niche, and Khenpo sat on a protruding rock to translate for us. We students were sitting on the dry grass and fallen tree trunks below the rock. It felt the way I imagine it was in old Tibet, with a handful of disciples clustered around their gurus on a hillside, receiving teachings and blessings. The most extraordinary thing about that Vajrakilaya empowerment was the hailstorm that followed. As soon as the shrine was packed up and the group photo was taken, it started to hail. It was hailing in July. The air temperature and the hail were pleasantly cool, and we were all laughing and excited while strolling back to the ranch house. One sangha member who couldn’t attend because he had to work 50 miles away in Grants, NM, told us that when he was driving back to the retreat, the sky was completely clear except for a tiny black cloud raining right over our retreat site and nowhere else. It was a magical time. Many years ago when the Rinpoches’ small and mighty retreat cabin was the only building on the land at PSL, several students gathered for the weekend. We pitched a tent near the tree line behind where the gonpa would eventually be built. Rinpoches created a place to cook for us, and a tarp was hung above. The next morning after sunrise we were awakened by someone walking around outside our tent. It was Khenchen Palden moving through the tall dew covered grass wearing knee-high rubber boots, lighting the fire and preparing to make tea and breakfast for everyone. Soon we were served a strong cup of black tea and Tibetan bread cooked in an iron skillet with peanut butter on top. It was delicious and one of the most memorable breakfasts ever! 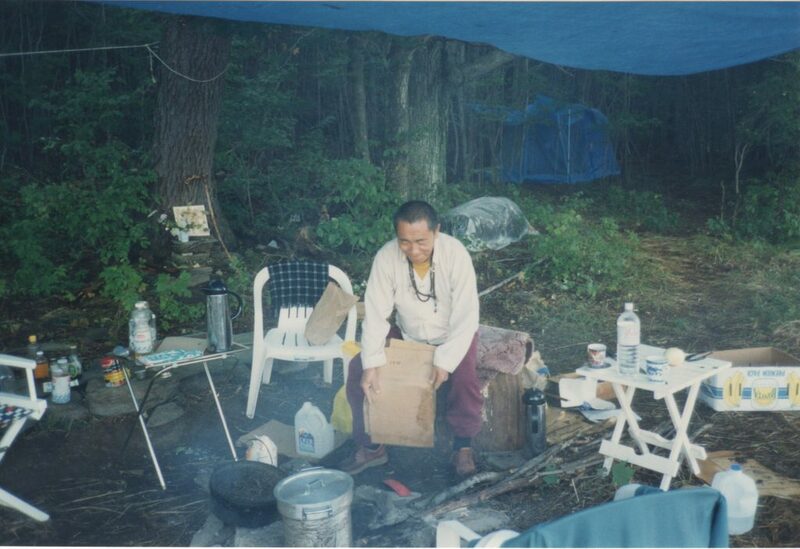 That day it rained so Khenchen Rinpoche placed a large bucket at the corner of the hanging tarp. There was no running water on the land then, so he was collecting the rainwater for washing dishes. By late afternoon the bucket was almost full. One of the visitors noticed the full bucket and must have thought that they were helping out when they suddenly picked the bucket up and threw the water out. We watched the moment unfold as Khenchen’s eyes grew large, his mouth fell open, and he gasped as the water hit the ground. Playing out before us was the perfect teaching of letting go. We were amazed to witness Khenchen’s expression of surprise and concern, and then instantly he was completely calm. Khenchen didn’t say a word. The visitor never felt that they had disrupted the campsite, and in retrospect they had actually facilitated an incredible teaching of letting go from Khenchen Rinpoche. After the visitor walked away, Khenchen once again aligned the bucket under the corner of the tarp and continued on without a trace of disappointment or discouragement. The rain continued to fall and we began again. Calm, fresh and new. Without a trace. One day I was walking with Khenchen Rinpoche up the driveway at PSL during a month-long retreat. Rinpoches had been giving the most profound heart essence teachings of the Clear Light Great Perfection for several weeks. After some time I asked him, “What makes us qualified to receive these profound and secret teachings?,” and he told me that we’d come from all around with the sincere interest and curiosity in learning and practicing the Dharma, and that was enough for him. Then I mentioned to Rinpoche how it seemed like some of us treated the teachings so casually, leaving precious Dzogchen books next to the shoe rack and garbage can with little mindfulness. 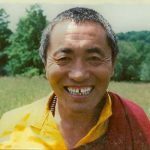 Khenchen Rinpoche stopped and looked me in the eyes, and spread his arms out as wide as he could, and said, “The view of Dzogchen is like this: as vast as the sky. Sooo big view. When you start looking at the faults of others—oh, they’re doing this wrong, that wrong—your view gets smaller and smaller…” He moved his arms closer together until his hands were right next to the side of his head, like a horse with blinders on. “That’s not Dzogchen, and that’s not Buddhism. In Buddhism, we look to our own mind, all the time. That’s the practice, and that’s what we should do.” I never forgot that. Sitting on the ocean beach, laughing as each chaotic wave came crashing into you, knocking your body over. 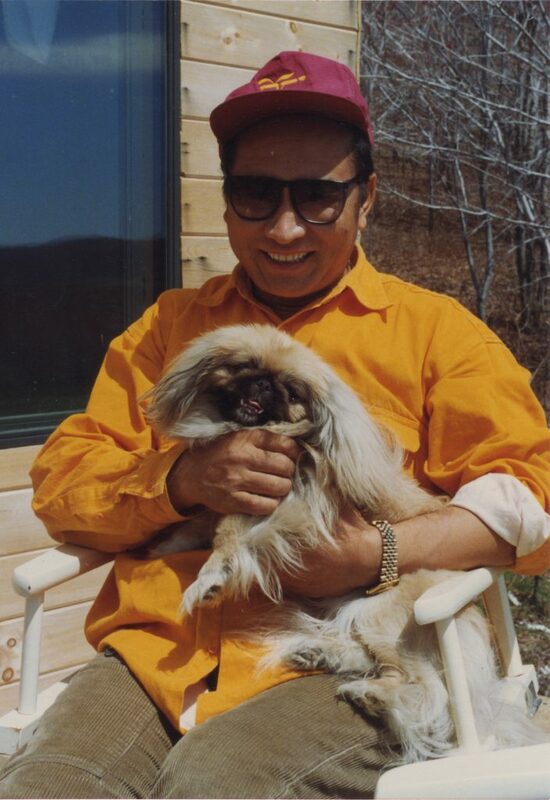 But your Dzogchen Mind stood still and your vast heart remained joyful. 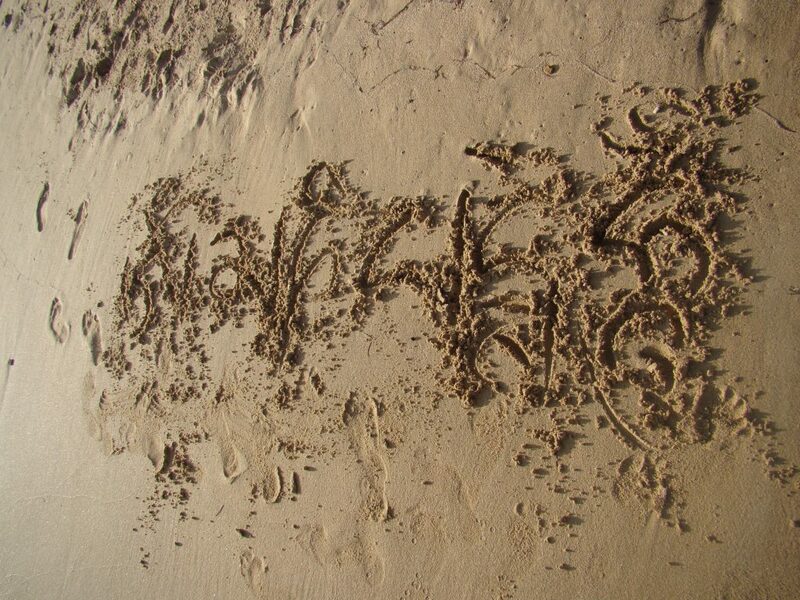 Writing a secret mantra in the sand, the energetic message merged into the ocean water spreading all over the world. The power of impermanence which reminds us to appreciate this moment. The infinite possibility of the one taste of emptiness that transcends logic. Accepting all situations, Just as they are, Silently, reverently, with a smile. Homage to our beloved teacher, Khenchen Palden Sherab Rinpoche: Master of the Art of Debating with No Debate. One evening I was leaving the Sangha house alone after sunset. It was starting to get dark and I was heading back to my tent. 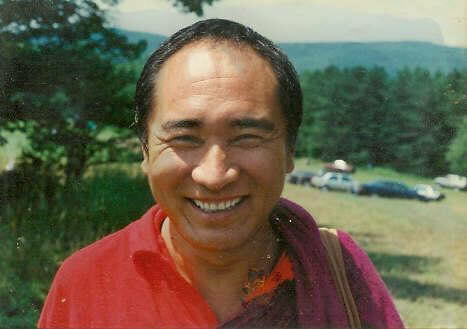 I came upon Khenpo Tsewang Rinpoche talking to someone who was in the back of a pickup truck. I couldn’t understand his words, I think he was speaking in Tibetan, yet his tone of voice was so gentle and sincere, I knew he was encouraging whoever was in the truck bed. By the time I crossed quietly behind him I saw it was his little dog Saymo who was the recipient of this kindness. Another memory is of the day I took bodhisattva vows with the Khenpo Rinpoches at PSL, and one of the first things they told me was that all the buddhas and bodhisattvas that ever lived were in the room at that moment. I could feel the truth of this statement so strongly that I felt a bit faint, and my heart was pounding. The ceremony was short, but very strong. I only had one burning question—what will I need to change and do differently now? The explanation I got in reply has been so important to me and I think of it often. “This vow is the only vow that you will take that will go with you through every lifetime. If you get married, it is only for this life, as are many other vows. You will always be a budding bodhisattva and that will follow you always.” Big sigh of relief. “You mean I can’t mess it up?” “No, you can’t even mess it up!” Khenpo turned to me and said, “You are only a little baby buddha. You are crawling on all fours at this point, and you’ll learn to walk, but you’ll fall down. That is what baby buddhas do.” I left that afternoon feeling clearer and more blessed than I’d ever felt. It was a great pleasure to offer Khenchen Rinpoche a memento to celebrate his birthday. Mimi helped me pick out a gift—a beautiful buddha statue. As she selected it, she said, “A buddha for a Buddha.” I thought how that truth was perfectly spoken. I wanted to offer something that conveyed a small token of my personal respect, affection, and devotion. The buddha was wrapped in a katag and carefully placed in a gift bag with a card. 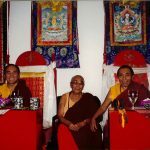 When I approached Venerable Khenchen, he gave me a broad smile and I told him how grateful I was that our lives had intersected and that he had placed me on this life-changing precious path. I gave him the gift bag. I thought he might open it later, but he took the time to find the gift in the bag and unwrap it. He gazed at the Buddha and then gave me a look with his eyes that made me feel as if I had given him the most precious gift he had ever received. And I said spontaneously, “A buddha for a Buddha.” It was the last thing I said to him. I am so glad that I had a chance to tell him how I felt and express my heartfelt appreciation. On the second night of the 2008 Vajrasattva retreat with the Venerable Khenpo Rinpoches at Yeshe Tsogyal House in Nashville, TN, everyone practiced The Shower of Blessings together. Towards the end of the practice, we read the last lines of the text before doing Dzogchen meditation: “Absorbed into one’s heart, inseparably mingling the Lama’s mind with one’s own mind in the self-born dharmakaya state … AH AH.” There was a very brief moment of taking a deep breath, and then I heard the sounds of light tapping on the tent as sudden, yet gentle raindrops began to fall on that beautiful, warm evening. It happened very quickly and naturally, yet I’m sure my eyes widened as I looked over at Kirby Shelstad who was sitting in the front corner of the other aisle. He was smiling as his head slightly tilted back and he placed his fingertips together in supplication. I looked back up at the Khenpos who were in silent meditation and then straightened my back and took another deep breath. A calm, warm, feeling of peace filled the room in the presence of the lamas. A shower of blessings indeed. It was Khenchen Rinpoche’s 71st birthday, and all the sangha at PSL gathered together to throw him a surprise celebration. We baked several sugarless cakes and covered them with candles. After we quietly entered the back of his house, we began singing “Happy Birthday” and our hearts lifted to join with Rinpoche’s aspirations as he blew out the candles. 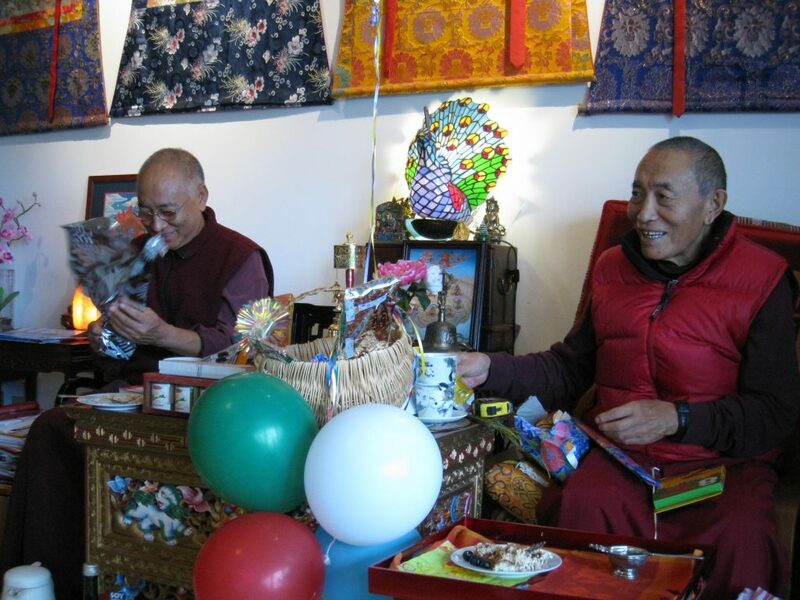 We gave Rinpoche balloons and baskets filled with presents we had amassed—some were personal gifts, but many were small, colorful ornaments, tools, and trinkets like pinwheels, toys, crayons, and markers. We had so much fun, laughing together as Rinpoche took his time opening every single present, one by one, giggling and playing. Such pure joy! At one point, Rinpoche went into his room and brought out some very special relics to show us, including stones with self-emanated buddhas and pieces of sky metal from Tibet that were naturally shaped as ritual symbols. 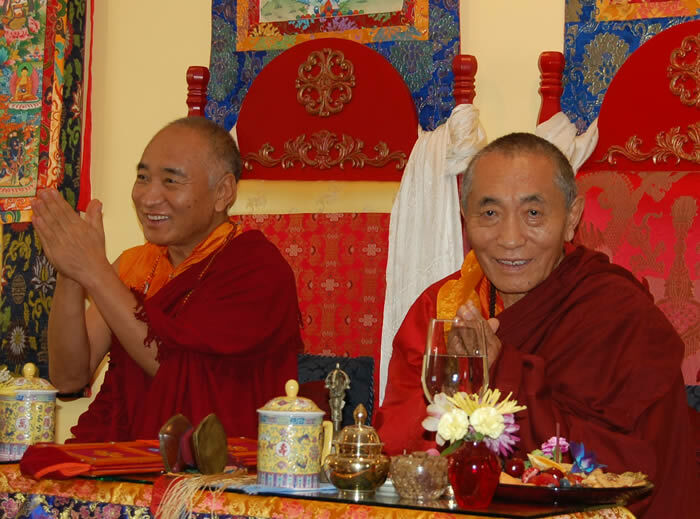 During the party, Khen Rinpoche said that right before we arrived he was reciting a Jigme Lingpa text, and the very moment we entered the house, he reached the part of the sadhana where there was a spontaneous tsok ceremony of dakas and dakinis bestowing offerings! How wonderful! 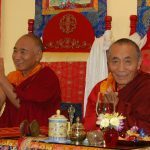 We had just entered a Mega Walmart and Khenchen Rinpoche was off—he quickly pulled out his pedometer and began walking down the long aisles at top speed! Khenpo Tsewang Rinpoche and Lorraine were getting a few things, and I was trying to keep with up Khen Rinpoche so we could all meet up soon. 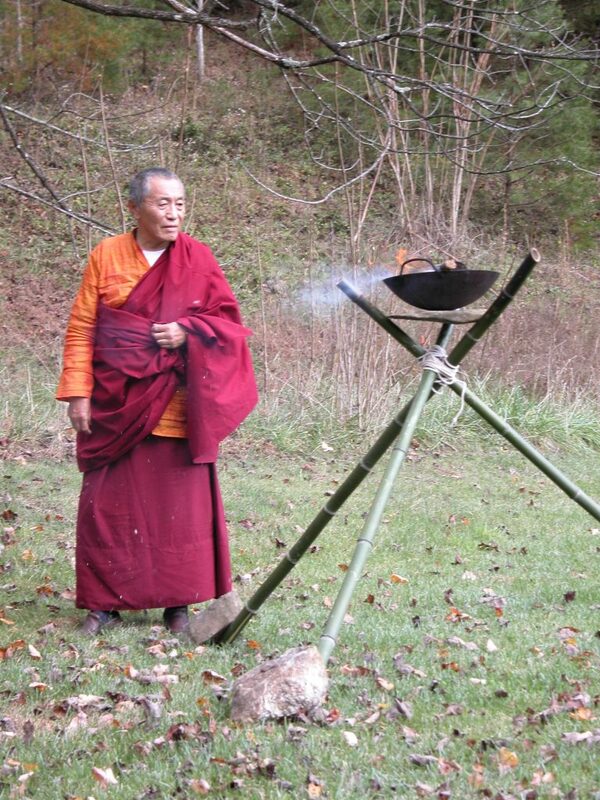 Khenchen Rinpoche actually had three things to buy, which was unusual: a new birdhouse for the birds around his cabin to enjoy, a soft-bristled broom he could use to sweep away caterpillars so he didn’t step on them, and a long metal serving spoon to make fire puja offerings with. After lots of high-speed searching, we only found a spoon that would work for pujas—the birdhouses didn’t fit the kinds of birds around PSL, and the broom bristles were too stiff and might hurt the caterpillars. How amazing and humbling to see how such a great bodhisattva only thinks of others. 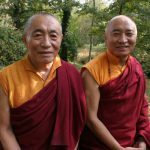 One time I went to visit the Khenpo Rinpoches in their apartment in New York. 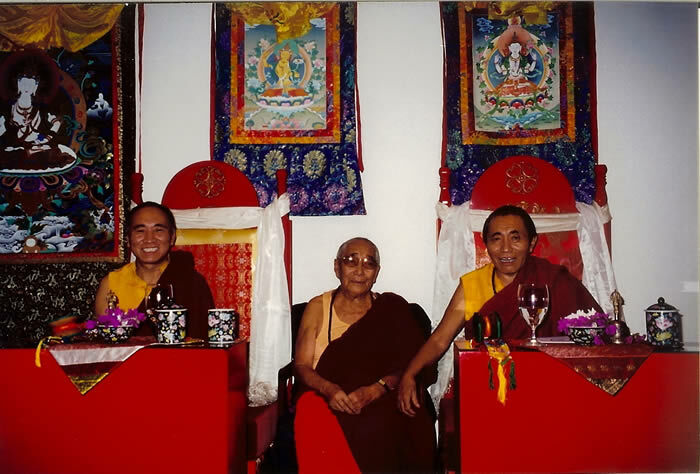 Lama Chimed had recently come to the US and was staying with the Khenpos at Lexington Avenue. 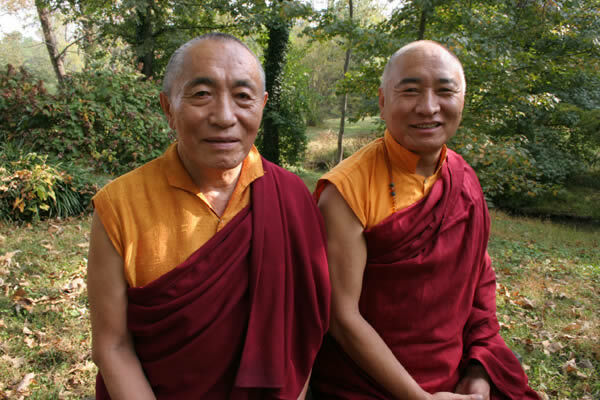 I remember Khenpo Tsewang inviting me into the back room, where Khenchen and Lama Chimed were resting and practicing. I began an elaborate description of why I was so dissatisfied with my life, how afflicted my mindstream was, how unfortunate my life circumstances. I must have gotten about 3 or 4 sentences into my description when Lama Chimed, seemingly oblivious to my effort to explain myself, doubled or tripled the volume of his mantra recitation. I remember turning my head to look at him, somewhat affronted, while the Khenpos looked a bit embarrassed. But the next thing I knew, all three of us burst into laughter. We couldn’t help ourselves. This must have lasted for about 2 or 3 minutes. We’d try and stop laughing, and resume the conversation, but then just start laughing again as if someone had leaked nitrous oxide into the apartment. 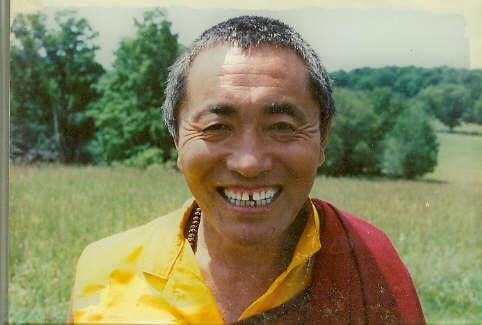 Lama Chimed just smiled and kept on reciting his mantras—he must have known exactly what he was doing. 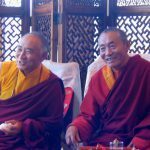 Finally, Khenpo Tsewang put on a serious face, and began to redress my misunderstanding concerning the nature of samsara, and my failure to recognize how fortunate I was in all circumstances. I remember thinking how human and yet how extraordinary were my teachers. 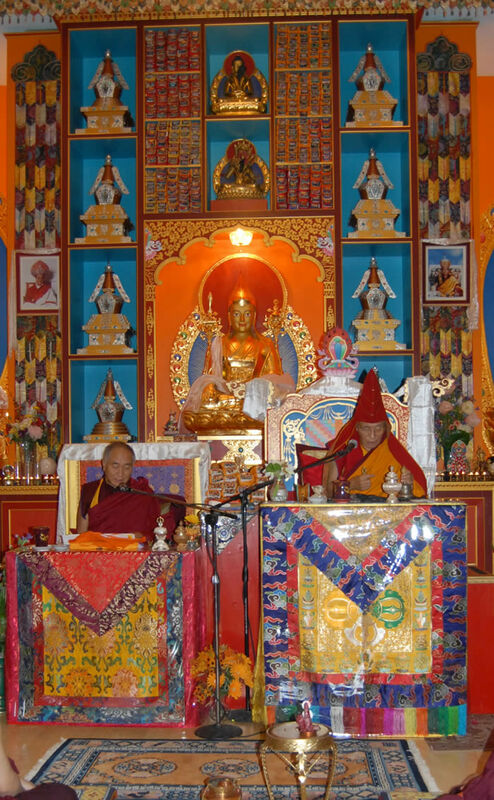 Another memory that presides most strikingly, even two decades later, is the evening pujas with the Khenpo Rinpoches, Lama Lorraine, Bill Hinman, and a couple other sangha members in Shravasti, India at the monastic ruins in Jetavan Grove, where the Buddha and his monks conducted summer retreats for 20 years. These were simple pujas—we didn’t have fancy drums, long trumpets, or lots of monks in red hats. We did have candles, matches, and the stones and bricks of an ancient monastery, reddened as the winter sun descended beyond the horizons of the vast North Indian plains. I remember everyone in the vicinity being drawn to these pujas, wanting to help light candles to illuminate the place of prayer. By the time our puja hit full force, the perimeter of our puja grounds was illuminated by a 1,000 thin wax candles, as we recited prayers to Vajrasattva, Padmasambhava, and Vajrakilaya. And finally, as the silence of meditation pervaded Jetavan Grove, a silence replete with the blessings and concentration of our teachers, I felt so keenly the aspirations of centuries of Buddhist monks who must have meditated in these very meditation cells, striving for wisdom and peace under the guidance of teachers in the lineage of the peerless teacher and guide, the sage of the Shakyas. And even though the blanket of darkness enveloped Shravasti, I can’t scarcely remember a time that I felt greater warmth and greater possibility than I did bathed in that deep silence, resonating with the prayers of my teachers, illuminated by the collective yearning that one day all beings, illuminated by wisdom and compassion, will find the path to true freedom, will enjoy the fearlessness of the bodhisattvas, and the freedom and bliss of the Sugatas. 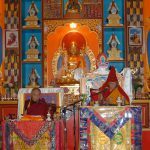 One of the first times I visited Padma Samye Ling, I had the great opportunity to join sangha practice and also do a personal retreat. The Venerable Khenpo Rinpoches had just lead practices for the Tibetan New Year and I was staying to practice for another week or so. Everyone who came for Losar had left, and Khenpo Tsewang Rinpoche and Jomo Lorraine were also leaving for a short time. I went to Rinpoches’ house to express my gratitude and see them off. While everyone was packing the car, I came to learn that Khenchen Rinpoche was staying to do some retreat also. After the joyous clamor of departure had concluded and the cars had rolled down the driveway, only Khen Rinpoche and myself remained standing in the silent winter afternoon. 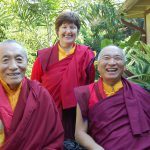 While I’m sure we spoke for a few precious moments before parting, what has always remained with me is Khenchen Rinpoche looking directly into my eyes and smiling. His warm, bright eyes and body radiating with fresh grace, strength, and majesty. And so simply. So light. So natural and unassuming, yet clearly looking, fully and deeply with insight. Simply kind! And there could be nothing greater, just like the Buddha’s teachings never stray from the truth for even a moment, but only become more profound, vast, and complete. This steady, down-to-earth goodness embodied by both our precious teachers manifests in countless ways to myriad beings. How fortunate to be at home with wisdom and compassion’s ceaseless display!